Culture Secretary John Whittingdale has bet £1,000 that David Cameron will remain Prime Minister even if the British people go against his wishes in June's referendum and vote for Britain to exit the EU. Mr Whittingdale, one of six ministers to declare for the Brexit campaign, denied his leader's position would be untenable if he was defeated on the issue. Boris Johnson has suspended his battle bus campaign across the East, after Labour MP Jo Cox was shot in her West Yorkshire constituency. Boris Johnson had been drumming up support in Norfolk and Suffolk for the campaign to leave the EU. "Just heard the absolutely horrific news about the attack on Jo Cox MP. My thoughts are with Jo and her family." The former London Mayor was due to visit Ipswich this afternoon, after spending the day on the Vote Leave battle bus in Lowestoft, Cromer and Norwich. The official campaign for Britain to remain in the EU has also suspended all activity for the day following the shooting. We are suspending all campaigning for the day. Our thoughts are with Jo Cox and her family. Prime Minster David Cameron has arrived in Bury St Edmunds. The PM was at the Greene King Brewery as part of his campaign to encourage voters to stay in the EU. Political rivals joins forces at Stansted airport in Essex to campaign for the UK to stay in the EU. The Chancellor George Osborne has been in Essex claiming that leaving the EU would be a one way ticket to a poorer Britain. He spoke alongside political opponents Labour's Ed Balls and Vince Cable from the Liberal Democrats as the Remain campaign staged an event at Stansted Airport. They warned that Brexit could mean an end to cheap flights and threaten investment such as the new Ryanair training centre which will create 450 jobs. The Vote Leave campaign pointed out that the Ryanair boss Michael O'Leary said only a few months ago that Brexit would not cause fares to rise. The Stansted announcement comes after more than 300 business leaders urged Britain to vote to leave the European Union, warning that the country's competitiveness is being undermined by its membership. In a letter to The Daily Telegraph, they argued that businesses will be "free to grow faster, expand into new markets and create more jobs" if they are unconstrained by EU rules. Immigration is a key topic in the EU referendum debate. ITV News Anglia has been to Wisbech in Cambridgeshire to explore the issues. Do you want to take part in an EU referendum programme? ITV is producing two live EU referendum programmes ahead of Britain’s vote to remain in or leave the European Union on June 23rd, 2016. 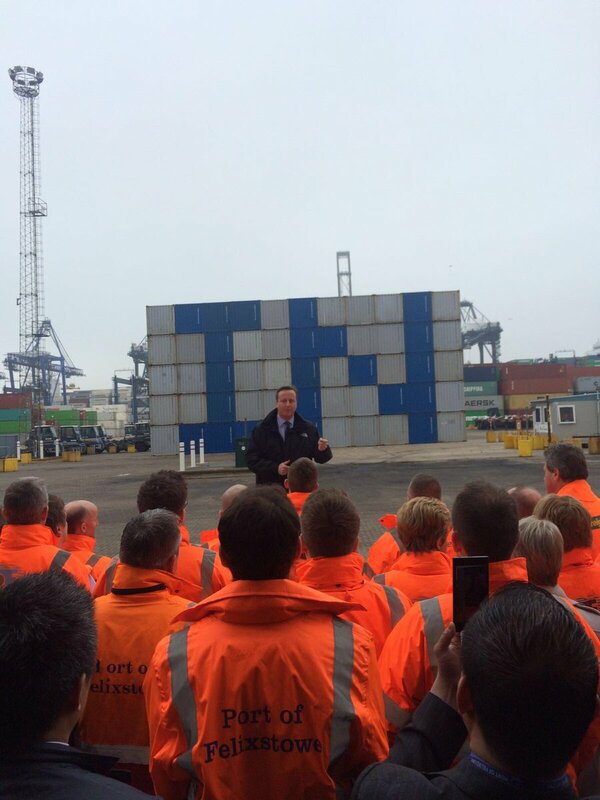 David Cameron is in the Suffolk port town of Felixstowe warning that Britain has "100 days to secure our future" as he ramps up his drive for a "remain" vote in the EU referendum. Mr Cameron urged the public to "play your part" in the poll on June 23. "In a hundred days you'll have your say - whether Britain remains in a reformed Europe enjoying all the benefits that brings, like lower prices in the shops, more jobs and safer streets or whether those benefits are put at risk by leaving. "We have a hundred days left to secure our future. It is a decision that will affect your future, your family's future and the lives of everyone in our country."